Dirck Jacobsz Vellert, a major artist of the “Northern Renaissance,” worked in Antwerp but his designs for stained glass were not limited to regional projects; during his career he received widespread recognition. Today, however, many of his pieces are lost and his fame has diminished. “The Triumph of Faith,” was one of Vellert’s six panels based on the poem, Trionfi (Triumphs), by the fourteenth century humanist Francisco Petrarch. A grisaille (gree-zai) – from “gris,” the French term for “gray” – often resembles a marble bas relief. This type of monochromatic work is painted usually only in gray and white values. 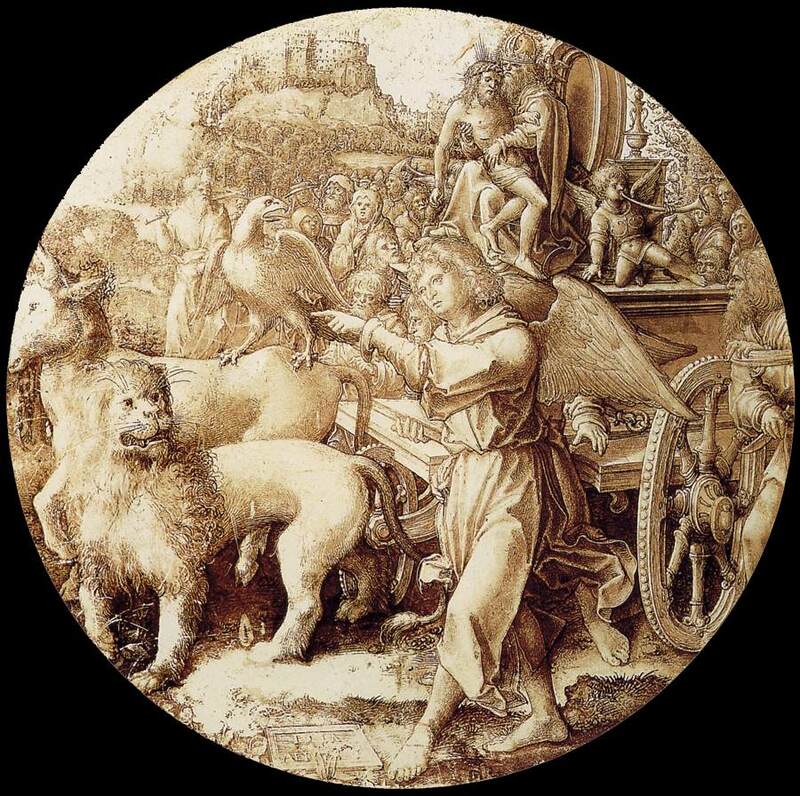 Vellert’s grisaille, however, is not a painting; instead it is created in a technique similar to enameling on glass. Vellert began with a tinted glass panel and painted it with oxides. He placed it in a furnace repeatedly to fuse the image as it was being created. In “The Triumph of Faith,” a crowd is on hand as the four evangelists, filled with faith, begin their journey into the world to preach the gospel. As a backdrop for this allegorical event, God is depicted in the upper middle ground wearing a crown and sitting on a throne-like chariot; the body of Christ is like a limp pieta in his lap. Two youthful angels (one is mostly hidden by God’s right leg), are on the throne with trumpets at their lips and they seem to be offering a send-off fanfare as the evangelists are departing. Matthew, symbolized by a human likeness, is pointing the way. The other three evangelists in symbolic animal form (Mark, a Lion; Luke, an Ox; John, an Eagle), are with him as they go into the world to spread the word of God. Matthew: The Book of Matthew begins with Christ’s human ancestry and in this gospel the human side of Christ’s life is given. Thus, Matthew’s symbol is a human likeness with wings. Mark: The Gospel of Mark tells the story of the resurrection. Once it was believed a lion was lifeless when it was born; it would be awakened to life by its sire’s tongue and roar. Thus the lion became the symbol for Mark. Luke: The Gospel of Luke tells of the passion of Christ. An ox was used in sacrificial offerings and by association it became the symbol for Luke. John: An eagle flies into the heavens. John soared into the heavens in spirit and thus the eagle became his symbol.